But after meeting Cody, an outsider boy, Lyla starts questioning Pioneer, her friends, her family - everything. And if there's one thing not allowed in the Community, it's doubt. As Pioneer cleverly manipulates his flock toward disaster, the real question is: Will Lyla follow her heart or follow Pioneer over the edge? From the outside looking in, it's hard to understand why anyone would join a cult. But Gated tells the story from the inside looking out, and from behind the gates things are not quite so simple. 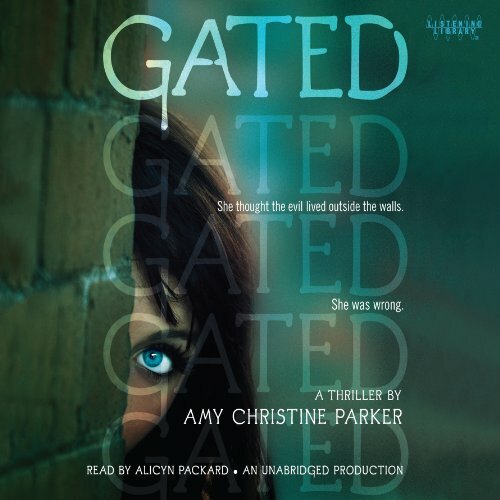 Amy Christine Parker's beautiful writing creates a chilling, utterly unique YA story. Perfect for fans of creepy thrillers and contemporary fiction alike. If you could sum up Gated in three words, what would they be? What was one of the most memorable moments of Gated? That terrible moment where Lyla realizes the truth. Poor girl! What does Alicyn Packard bring to the story that you wouldn’t experience if you just read the book? This was a super creepy book. Cults are terrifying to me, and this was a first hand look into them. The quotes are very poignant and set the scene beautifully.